All transactions are safe and secure with a reliable history in online purchasing behind each of our associates. Buy the Hangover Wolfpack Names t-shirt to own Hangover 2 clothing and merchandise. Sometimes plain and simple is exactly what the shopper ordered. 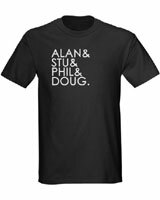 This Hangover Wolfpack shirt features the names of its members including bearded oddball Alan, glasses clad dentist Stu, wild child school teacher Phil and down to earth Doug. Whether you prefer the original or the sequel, this tee has all the bases covered and is available for men, women and children. If you are looking to put a little fun and excitement into your life, check out the temporary Stu tattoo. It's perfect for a Stu costume. In addition to the Hangover Wolfpack Names tee above, browse the Hangover 2 Clothing Gallery for more apparel like men's and women's clothes, kids shirts or hoodies.